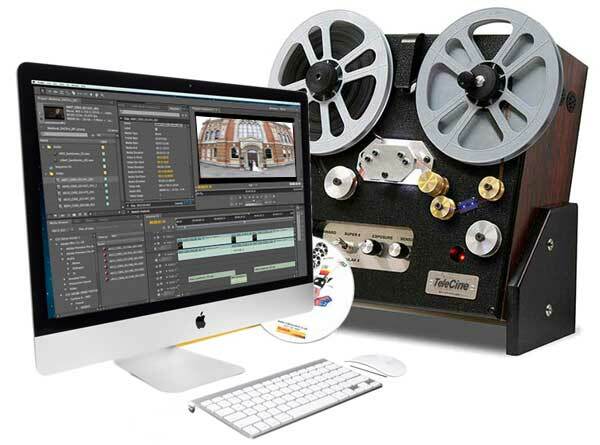 Transfer, copy and conversion of Super 8, Standard 8mm, 16mm and 9.5mm cine film to DVD and Digital File Formats. for home editing. We are a specialist cine film and video transfer business established over 15 years. We operate from Studios in Camden High Street, London. Callers are welcome to pop in anytime and we welcome mail order customers. Huge advances in film scanning technology, and continual investment in the latest cutting edge equipment means we can bring you exceptional quality at the cheapest ever prices. Advantages of our cine transfer system. Apart from straight film capture, for a small extra cost cost you can choose to titles, captions and a sound track added to your cine transfer. However, we we always add our professional expertise, gained years of creative experience. Please note that running times are approximate as they depend on the frame rate. Instead of encoded DVDs for watching on your TV system, you can choose to have digital MOV files for home computer editing. We can convert cine film to MOV) computer files, ready to view and edit on your Windows or MAC computer. Each minute of cine film takes around 1gb gigabytes so the files will need to go on a USB hard-drive or large capacity USB stick. You can provide your own, or buy one of ours. 16mm cine film is so-called because it measures 16mm across. 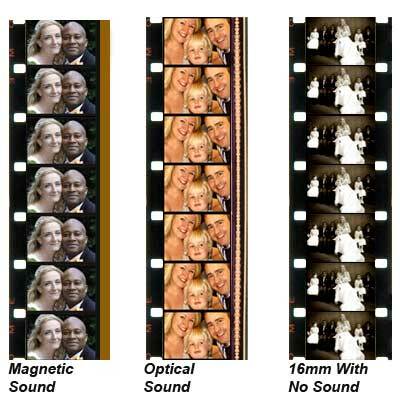 There are three types of 16mm in common consumer use. These are 16mm film with a brown magnetic sound strip down the side, 16mm film with an optical sound strip down the side, and finally, cine film with no sound. 16mm cine film transfer - " I had no idea what was on the old 16mmmm cine reels shot over 30 years ago. I had never seen any of what was on the film and was surprised to see our one day old daughter who is now 31 years old So many treasured memories were gathering dust in the attic all this time. I urge everyone to get those old movies put onto DVDs before it's too late. A fabulous opportunity to bring the past back for future generations to enjoy - Thank you"
Prices for 16mm cine start at £25 per reel. We normally like around two weeks to turnaround customers 16mm cine film but if we need to, we can beat any deadline.Don't worry if your reels are not completely full, we will only charge for the actual cine footage. For full details of 16mm cine cost download our PDF price guide. We have studios on Camden High Street, London were all work is done onsite. Callers are welcome and Mail Order customers can shop online with us with complete peace of mind..
For various reasons, your cine film may have undergone a shift in colour balance. Typically, a magenta, pinkish tinge is often seen. Colour correction, optimisation, enhancement and adjustment services are available..
All cine film that comes into our studios is assessed for damage and cleanliness, FREE OF CHARGE. Typically, films may need resplicing and a puff of compressed air to remove dust and hairs. On occasion, cine film comes in smelling of vinegar - Vinegar Syndrome, or may be badly affected with mould and mildew. If this happens, we will contact you to discuss the options.